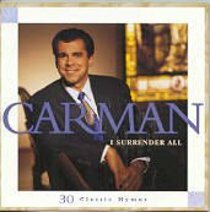 THIS EXCITING NEW ALBUM SHOWCASES CARMAN AT HIS BEST, PERFORMING THIRTY OFTHE CHURCHS BEST LOVED HYMNS. THE PRODUCTION RANGES FROM TRADITIONAL GOSPEL NUMBERS TO FULLY ORCHESTRATED ARRANGEMENTS, WITH SOMETHING TO SUIT EVERY LISTENER. SONGS INCLUDE: HIS NAME IS WONDERFUL, AMAZING GRACE, WHAT A FRIEND WE HAVE IN JESUS, AND PEACE LIKE A RIVER. FROM SPARROW. Customer Reviews For "I Surrender All"
I gave this as a gift to someone and they loved it. I had the privilege of listening to the album with them and have some thoughts regarding this album. I am a big fan of Carman and have probably all of his CD's. I really enjoy his music and this album is no exception. However, I must say that this is not my favourite of Carman's albums. It still sounds like Carman but is a more traditional sound than his other albums. Some of the songs are  based on older hymns, which I did not know, but the person I gave this CD to loved it. I would still recommend this album to others. It is lovely. Carman's voice is lovely to listen to and the CD is a good length.